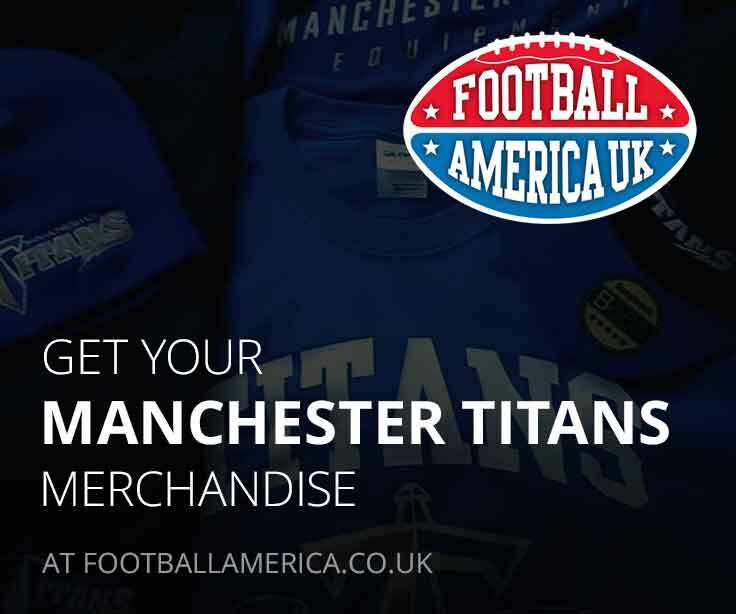 Having launched in 2017, the Titans U17 and U12 flag teams have been training hard ahead of their debut season in the BAFA national leagues. 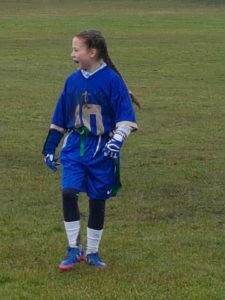 Having previously only played a single friendly game in 2017 against the Chorley Buccaneers, this tournament represented the first official outing for the youngest Titans. Hounary tournament captains – Ann-Marie Jessop, Reid Whitelan, John Arnold and Tom Hamberis. QB Luke Johnson and the Titans offence took to the field for the first time showing plenty of excitement, unfortunately a couple of incomplete passes and a short run by Eve Harrop took our opening drive to four and out. Not wanting to be outshone, the Big Blue defence returned the favour with quick reflex tackles from Holly Jessop and Noah Clarke holding Chorley to a limited 15 yards and another turn over on downs. With the rainy weather effecting passing game, Luke Johnson turned to Running Back Eve. And boy did Eve answer!!! On 3rd down a massive 45 yard run give the Titans a 6 – 0 lead and gave Eves mum plenty to jump about (yes we all saw). The next half started the same with both offences being held to minimal yards. On Chorley’s second drive, the forever smiling Kimo Tarek stood firm and made an awesome tackle allowing only short yards. The very next play, Darrion Banton-Wright timed his jump perfectly and intercepted the ball. After a quick 4 and out by the blue Offence, Darrion struck again, this time taking his second interception of the game 45 yards for a pick 6. Unfortunately the referee saw an illegal block, cancelling out the 6 point return. The Blackbeard’s took their ‘second chance’ card and with a short lapse in concentration, a 30 yard passing touchdown and a successful PAT (point after touchdown) concluded the first game. It looked like the start of monsoon season in Chorley as the Titans moved onto the second game of the day. Solid tackling and tricky offensive plays by Burnley saw the score quickly reach 0 to 28. The bad weather continued and by the start of the second half the field had turned into a mud bath making moving the ball tough for both teams. 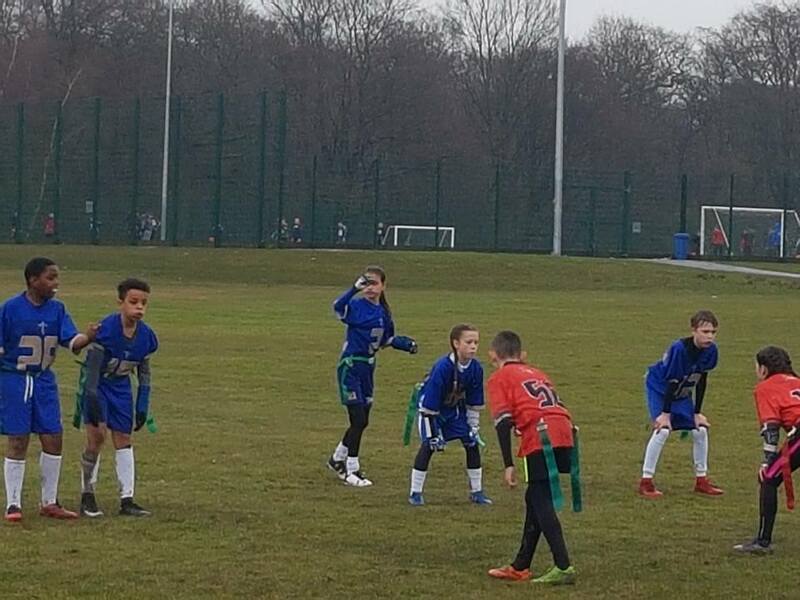 Not accepting defeat Manchester kept their battling spirit alive, firstly with a 10 yard catch by Holly, followed on the next play with a quick hand off to Luke and a 50 yard scoring run took the game to 6 to 28. Slippy field conditions led to miss tackles and Burnleys final score of the game. Moment of the day goes to Team Manager Charlie Novak for her highly comical muddy somersault! A change of field made for a much faster game and the Titans took an early lead with a 55 yard run by Luke, giving him his second score of the day. The Redbeards took to the field, but couldn’t move the ball more than 10 yards, thanks to the quick tackling reflexes of Kimo and Noah. Another successful drive took the Titans deep into Red territory and on 3rd down a 10 yard catch by Holly put Manchester on the 3 yard line. A incomplete 4th down pass attempt gave control back to the Redbeards. On the next 2 plays the Big Blue Wrecking Crew stood firm with a two minus yardage tackles from Darrion and Luke. Sadly a complete 3rd down pass and PAT took the score to a 6 to 6 draw, closing the half. 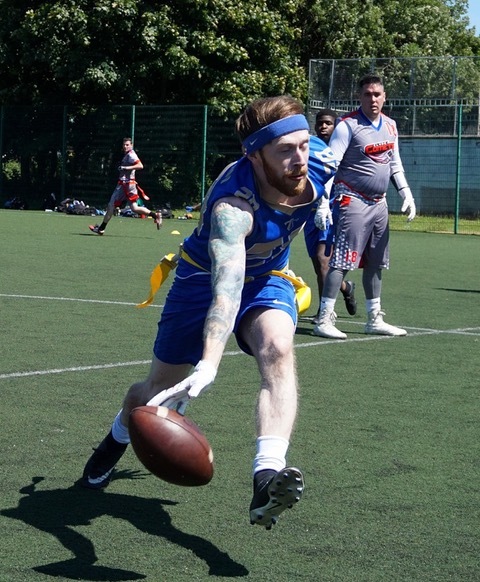 Strong runs by Eve and Luke couldn’t gain the Titans a second half lead and with tiredness beginning to show the Redbeards large squad took the game to a 28 to 6 finish.